This is a book I read "when I was young" and decided to revisit, via a birthday gift certificate to Borders from a friend. I'm interested in collecting and re-reading books that I read when I was younger for my own kids. I'm rather enjoying reviewing and refreshing my own memory. This is one I have fond memories of. It's listed under "Juvenile Fiction" which is very fitting. Written by Barbara Park, I remember laughing outloud at the sense of humor which she gave to the main character, a skinny little kid by the name of Alex Frankovich. 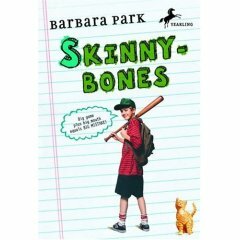 He insists to the school bully, T.J. Stoner, that his bones aren't skinny - it's just that Stoner's bones are a little on the chubby side. (This, of course, results in the typical "bully sitting on the head of his victim" routine.) I read this book over and over again when I was about 12 years old. Twelve years old is probably the best age to appreciate Park's humor. I'm pretty sure it stops fairly soon thereafter. However, I did get a chuckle or two out of it this time as well. At the same time, certain things about the book bothered me that I had never noticed before. For instance, Alex is a smart aleck. I can tolerate that in a character to a degree. I have my limits though and Alex crossed over them. He smarts off to his parents a little more than I would like. True, it's in an easy-going manner which makes it easier to swallow. Regardless, I'm not sure I'd appreciate if my son or daughter were quite as dramatic in their word usage as is Alex Frankovich. I felt like his parents let him get away with things a little too frequently, although they certainly did not ignore his behavior. They just adapted to it in a manner that I wouldn't. This causes me to debate whether or not I would let my own kids read this book. Barring objections from The Husband, I believe I would. Of course, they'd have to recognize the bad behavior which Alex does periodically exhibit. As to the cuteness of the story - it is that. Cute. It's the story about a geeky kid who plays little league baseball on a team that hasn't won a game all season. He plays right field as a result of his coach's hope that he won't be a necessity to winning the game. Each and every year, at the end of baseball season, he receives the "Most Improved" award. He knows he stinks. He pokes fun of himself, but doesn't quite care when other people do the finger pointing. He's short and small and longs to be big and tall. He dreams big dreams about success and fame. In short (pardon the pun), he's a sensitive kid who covers his emotions with humor and sarcasm. I can't recommend it, necessary, as a "harmless" story. However, if reading pre-teens are thinking people, I think they could enjoy the humor and dismiss some of the parental interaction and keep a proper perspective. And, quite possibly, achieve a few audible laughs.